Always strive to be better — that’s what recent George Washington University graduate Colin Curtis advises. Colin was able to leverage his education and expertise to start his own business in Washington, D.C. He has been successfully working on political campaigns for more than a decade. Growing up, Colin volunteered with the Young Democrats and worked on local campaigns for the Kansas Democratic Party. After earning his undergraduate degree, he worked in the Kansas political arena for a few years, but wanted to grow as a campaign manager, political consultant and lobbyist. He felt that a master’s in political management would be an excellent gateway to polishing his talents. Colin researched GW initially because of the great reputation of both the school and the program. After he learned more about the professors, he knew GW was the right school for him. Colin was surprised by the relationships he was able to build with both his professors and cohorts throughout the program. 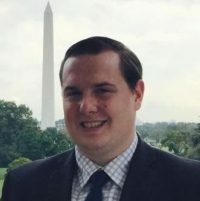 Colin credits his master’s degree in political management for helping him receive promotions and allowing him to feel more comfortable at a higher level.